Costa Rica never had a thriving indigenous culture such as the empires of the Mayan, Aztec or Inka people. The native people were culturally influenced by Mesoamerican tribes from Central America and cultures from northern South America (mostly today's Colombia). 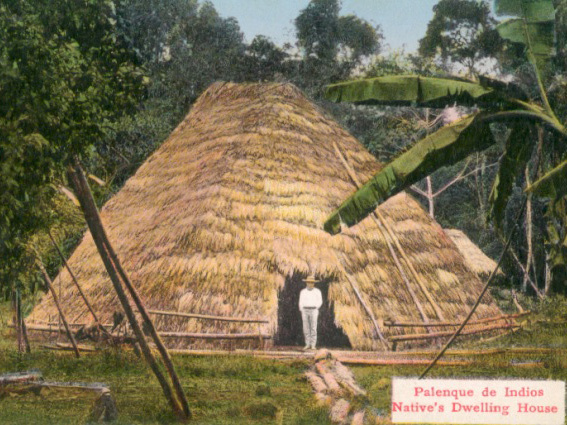 Most indigenous groups lived on simple subsistence economy and were ruled by a chief called "cacique". When the Spaniards arrived, many tribes moved back into the mountains in order to avoid slavery and taxation by the Spaniards. 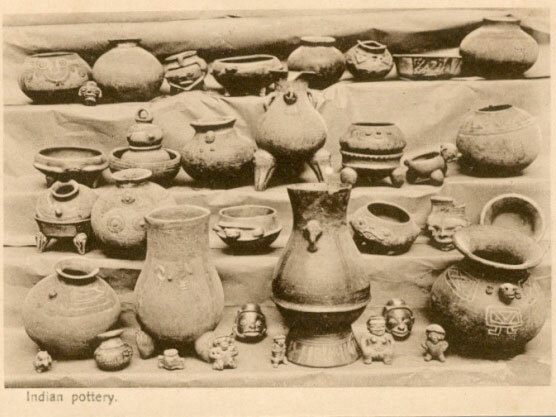 Costa Rican indian culture did not leave many artifacts behind – most are simple products like pottery and ornaments. 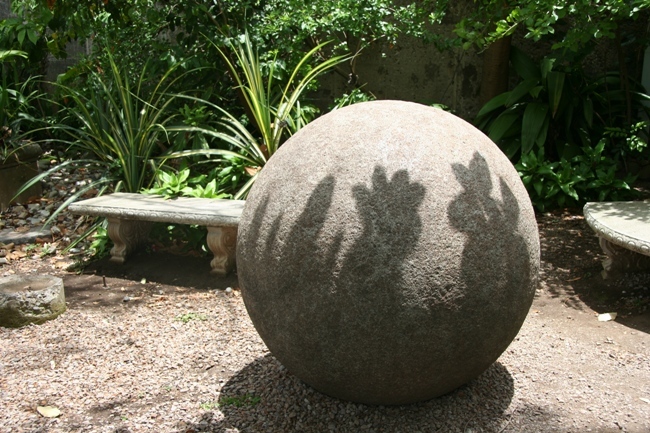 Most prominent are the stone spheres (see picture to the right) that were found in the country´s South (area of the Térraba river around Palmar Sur/Palmar Norte). Some of theses spheres weigh up to 15 tons and it is unclear how they were manufactured and transported as well as what they were intended for. The decimation of the indigenous of Costa Rica was due mostly to diseases, rather than targeted genocide (as happened in other Latin American countries, most prominently Guatemala and El Salvador). Today, there are only about 64'000 indigenous people living in Costa Rica (around 1.7% of the population), mostly living in remote mountain zones. 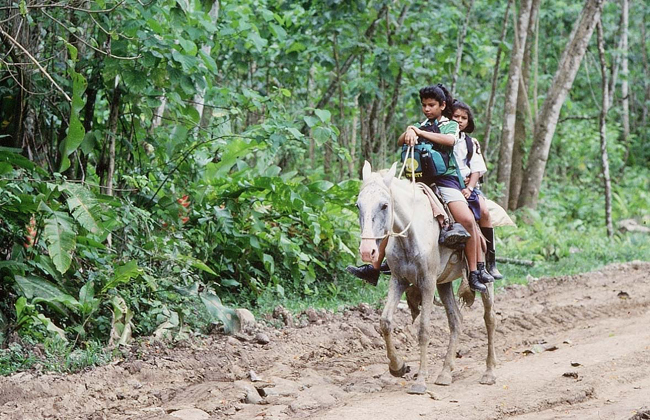 Are you interested in visiting some indigenous villages in Costa Rica on a tour? Contact us and ask for further information. We can organise tours to visit the indigenous Bribri, Cabecare, or Boruca in Costa Rica. The increasing loss of territories is the major problem faced by indigenous peoples and it is the source of other difficulties such as the creation of educational systems and political ideologies. Eventually, everything about their cultural identity is affected by changes of culture, economy and politics. Traditional practices continue to be deplored, even persecuted, as is the case for traditional medicine, indigenous religious beliefs and social customs. Slowly, their original languages and cultures are being taught in local schools, but there is a long way to go until they reach full cultural independence. The indigenous law of 1977 was established to curtail the loss of land of the indigenous population. Indigenous people were unsufficiently educated (with a high percentage of illiteracy) and subsisted mainly on agriculture, thereby being strongly dependent on fluctuations of the market. A bad harvest could mean the loss of all resources. That way, their land was sold step by step to the mestizo population of mainly European descendance. Here is an example of how this worked: An indigenous farmer has no money and buys seeds and food on credit from a latino merchant in town. If the harvest is poor, the farmer is insolvent and pawns his land to the merchant. That way, the indigenous people were virtually disappropriated step by step. The indigenous law was established to stop these processes. Article 3 of the indigenous law (Nr. 6172) states that land property in indigenous reserves is only allowed for people with indigenous provencance. Land property can only be traded amongst indios and all transactions that occured prior to the law, become void. Article 9 declares that land on indigenous reserves must be transferred to the indigenous communities. But today (in 2010), a large part of the land is still populated by up to 80% of non-indigenous inhabitants. Article 5 stipulates that non-indigenous persons who have land in native reserves or would be "owners in good faith" in these reserves, will be compensated in return for surrendering the lands that are reserved exclusively for natives. This text is not always applied, because the inidgenous population did rarely enforce the expropriation (due to misinformation or because they were advised against it). A Problem of the law is that it restricts the economic independence, since no official land property is possible within the reserves. The original idea was to preserve the land. But the downside is that it makes indigenous areas unattractive for investors, as they are not interested in investing money into something they have no control over. But since the indigenous population has little resources, they have no way of raising funds (as long as they don't get state-supported credits). Further, despite of establishing this law over 30 years ago, most of the concessions made, remained lip services on the paper. The population is still discriminated, and when the government chooses to build a power plant (like the Diquí project) the opinion of the indigenous people is vastly ignored. Here is the law's original legal text. Many studies on the subject consider the Bribri and Cabécares as part of the same ethnicity. They share the same religious belief in Sibo as supreme God and creator of the universe. 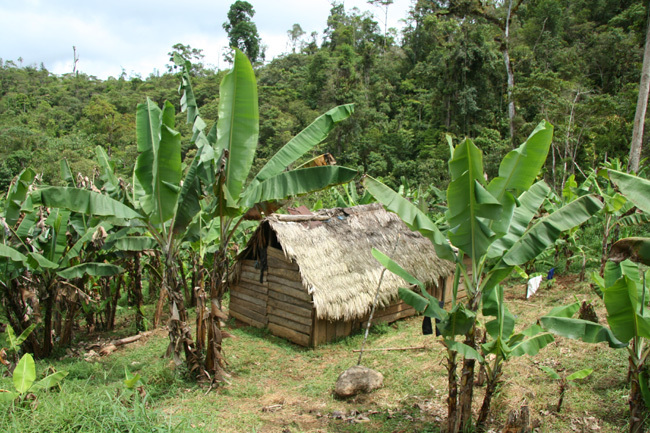 While parts of the Bribri tribe live the lowland areas of the Cordillera de Talamanca, the Cabecarés are isolated in the mountains of the Cordillera. They are less influenced by the progress than the Bribri and maintain a complex clan system. 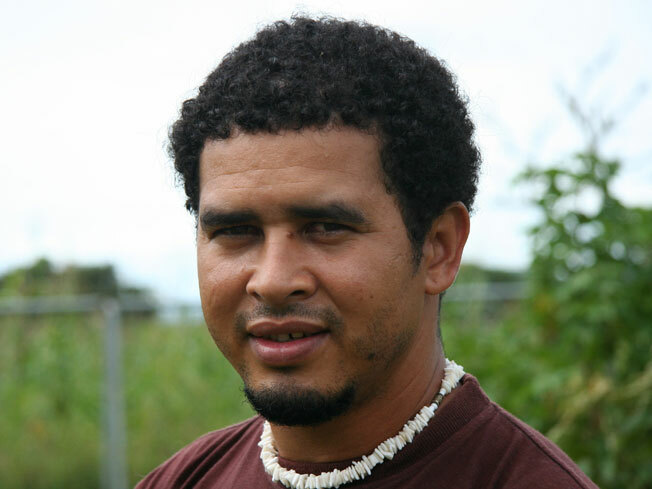 There are around 10'000 Cabecares, who still preserve their language, natural medicine and patrimonial culture (caciques are allowed to marry several women). They have a rich corpus of stories and legends, some of which are written down in Spanish and the Cabécar language. Location: Southern Atlantic Coast, Limón province, Chirripó (Pacuare valley), valley of the Rio Estrella and the Talamanca reserve. Ujarrás de Buenos Aires and China Kichá. Cultural Identity: This is probably the indigenous group with the most distinct cultural identity. The original Cabécar language is still spoken next to Spanish. The Cabécares have retained many of their customs and traditions and clan ties are still very tight. Activities: agriculture (coffee, cocoa and bananas), bird hunting and fishing. It's possible to visit areas where Cabecar Indians still live in their traditional way. Contact us to find out about such excursions. Location: Southern Pacific: Puntarenas province, indigenous reservations of Salitre and Cabagra in the Canton of Buenos Aires. Southern Atlantic: Limón province, indigenous reservation of Talamanca. Cultural Identity: The Bribri retained their spoken language and use the Latin alphabet and a number of additional characters for phonetic transcription in writing. Activities: Agriculture (cocoa, bananas, corn, beans), pig breeding, bird hunting. Crafts: basket weaving and manufacture of musical instruments with natural materials, fabrics and fiber with natural pigments. To cross the river Sixaola on the border of Panama, they use dugout boats and rafts. Today there are hardly only few Térrabas in Costa Rica. Location: Canton of Buenos Aires in the Reserve of Boruca-Térraba. Cultural Identity: although this ethnic group has preserved its cultural identity, the original language Terraba no longer spoken today. Activities: Agriculture (corn, beans, rice, bananas, citrus fruit). Today their territory is populated by many non-indigenous peasants. The indigenous Borucas of Costa Rica are still in close touch with their ancestral traditions, as expressed by their legends, dance and crafts. They are particularly known for the “Fiesta de los Diablitos”, a 3-day festival taking place from December 30 to January 2. During the festivity, fights between the native Boruca indians (the devils) and the Spanish Conquistadores (the bull) are staged. The Borucas use wooden masks and drink lots of home-made chicha (chicha is a fermented alcoholic beverage, derived from maize). 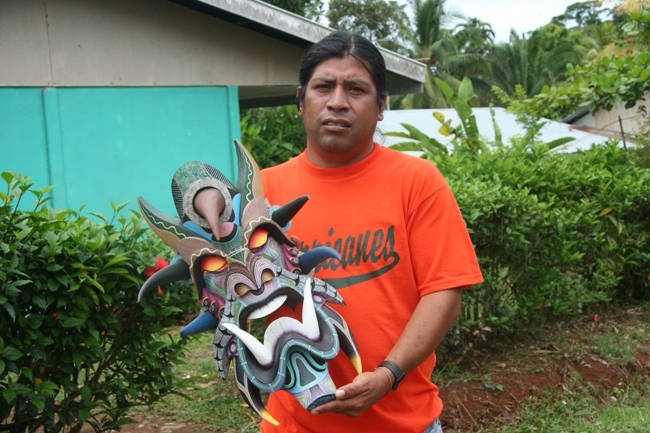 Cultural Identity: The Borucas are particularly known for their elaborate handicrafts, most of all the masks that are made for the fiesta de los Diablitos. Crafts: cotton-based fabrics, natural colors for dyeing, manufactures of wooden masks used in "Fiesta de los Diablitos". We organise tours to the village of Borucas, where you can learn more about the local culture, arts & crafts. Contact us for more information. 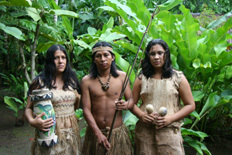 Guaymies are the largest surviving native people in Costa Rica. In the 1960s, the Guaymas, also called Ngöbegues, emigrated from Panama to Costa Rica. Activities: Agriculture (cocoa, rice, beans, corn, palmoil and bananas). Hunting, fishing, pig breeding. The Malekus are one of the smallest indigenous groups in Costa Rica. Among all the Indian tribes, Maleku are those with the least land property: 40% of the families do not own their land. Unemployment is also high at 10%. The Malekus are dominated by non-native residents on their own land: 62% of the reserve is inhabited by non-natives, which has generated a process of increased mingling in recent years. Location: Northern plains of Costa Rica, Alajuela province, Canton de San Rafael de Guatuso. Cultural Identity: Maleku is still spoken next to Spanish. In order to conserve the use of traditional language, school education is provided in both languages. Activities: agriculture (cacao, pejibaye, palmoil), freshwater fishing. 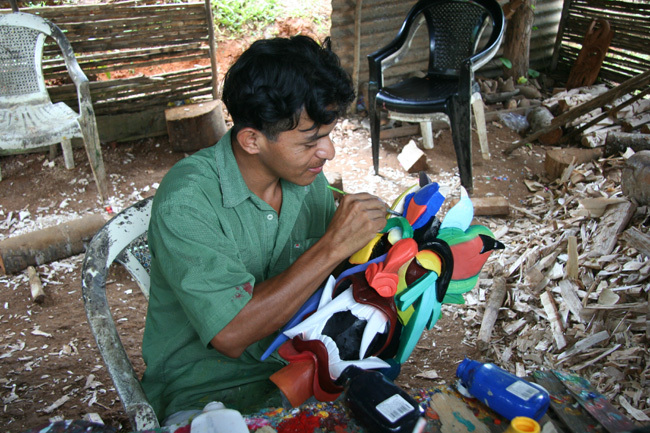 Crafts: manufacture of figurines, ceramics, making rafts, bows and wooden arrows. Location: Guanacaste Province, Canton of Hojancha, Matambú indigenous reservation, villages of San Vicente, Guaitil and Santa Barbara. Cultural Identity: The original native language is no longer spoken, but the ethnic identity is still maintained. Customs and traditions are kept, for example as the production of ceramic pottery, figurines. Only a small community of native Huetares has survived to this day. Cultural Identity: The cultural identity has been somewhat lost, although certain traditions, such as the Fiesta del Maíz, and the use of medicinal plants, have been preserved. Today Huetares speak Spanish. Activities: the natives' land is relatively unfertile and a varied agriculture did not develop; corn is one of the only products grown by Huetares. Crafts: products based on palm leaf, fodder and vegetable fibers. The Huetares are specialists in natural colors for dyeing clothes. Ceramic artifacts are sold at roadsides and at "ferias" (markets).